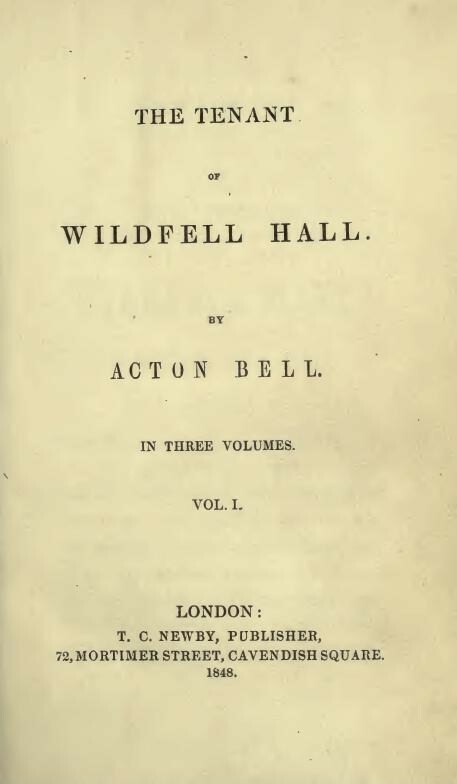 Just I had foreseen after reading Agnes Grey earlier this year, after The Tenant of Wildfell Hall, Anne-the-forgotten-sister officially became my favorite Brontë. The Tenant is the story of Helen, who in her late teens, and against the advice of her family, falls in love and marries a man who apparently is all charm and passion. As time goes by he reveals himself an abusive husband, a gambler, alcoholic and generally a scoundrel. When Helen starts to realize the dangerous influence her husband has on their son, she decided to run away. Her plan is to lead a reclusive life and earn her own money by painting, but the curiosity and malicious gossip of her new neighbors puts her secret, honor and safety in jeopardy. Thereupon Mr. Huntingdon, gathering his coat-laps under his arms, and setting his shoulder against the mantel-piece, turned to me, and, addressing me in a low voice, scarcely above his breath, poured forth a volley of the vilest and grossest abuse it was possible for the imagination to conceive or the tongue to utter. [Anne] had, in the course of her life, been called on to contemplate near at hand, and for a long time, the terrible effects of talents misused and faculties abused; hers was a naturally sensitive, reserved and dejected nature; what she saw sank very deeply into her mind: it did her harm. She brooded over it till she believed it to be a duty to reproduce every detail (of course, with fictitious characters, incidents and situations), as a warning to others. 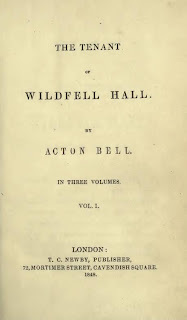 These “terrible effects” contemplated “near at hand” were of course the decline into alcoholism of their brother Branwell, which for siblings as close as the Brontës must not have been easy to witness. The Tenant might be a strong warning against vices and the eternal struggle between good and evil, but more or less explicitly it is also an ode to feminism. At a time when the wife had to endure and atone for her husband’s sins, Helen shuts the door of her room in her husband’s drunken face, thus denying him his marital rights. She even advises a friend to resist her family’s desire for a marriage of convenience. Girl power! Anne Brontë also answers a question that other novels of her time do not ask: what happens to a marriage and to the innocent partner when one partner (specifically, the male) leads a solipsistic life, where personal pleasures are seen as deserved, where maleness and the role of husband is tied to the freedom to do as one wants, and femaleness and the role of wife is linked to providing service and pleasure not necessarily sexual, but including daily praise and ego-boosting and, quite simply, constant attention. Although I gave it a 5/5, I still had some problems with the book, in particular the romance between Helen and Gilbert (her new neighbor). It just didn’t convince me. I couldn’t understand what attracted Helen or felt any spark coming out of the pages, which is a shame, because the closing chapters focuses a lot on their relationship. At some point he felt positively stalker-ish and during the rest of the story just simply… meh. Is this lack of romantic passion why Anne is so underrated compared to her sisters? She just doesn’t seem able to apply her strong feelings against injustice into creating the type of chemistry you see in Jane & Rochester or Catherine & Heathcliff (even if both these relationship have something of the dysfunctional in them…).